A week ago, just three days after dismantling rival Daniel Cormier in a brilliant title defense, UFC light-heavyweight champion Jon Jones announced he was entering a drug treatment facility after testing positive for cocaine on a December 4 test. "I am taking this drug treatment program very seriously," he said in a statement, and UFC president Dana White and the promotion itself issued supportive statements of their own. As it turns out, though, according to his mother, Jones checked out of rehab after just one day. "I'm glad that this happened to Jon, this stopped him in his tracks, this let him know that he may need to change some friends, you know, because everyone is not for you for the best," Jones's mother, Camille, said in an interview with Binghamton, N.Y. television station WBNG. 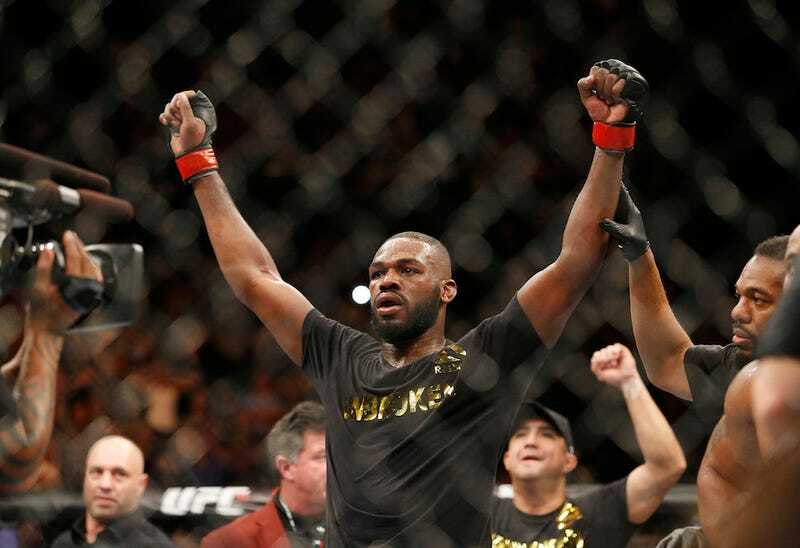 News that Jones was using cocaine a month before a title fight was a bombshell. It would be easy to chalk the collective handwringing at the news up to disingenuousness or naïveté—Jones, after all, is a 27-year-old multimillionaire in the Year of Our Lord 2015—but there's more at play here, too. The week before the fight, Deadspin published a profile I wrote on Jones. Much of it focused on the dichotomy between Jones's public and private personalities. Here is a man who professes in public to be a devout Christian, a devoted father and husband, and, more to the point, a humble, low-risk celebrity whom the brands can get behind and ultimately pay to sell their products. Here, too, is a man whose career was only launched because he strayed from the teachings of Christ, who isn't the paragon of fatherly values he pushes, and most important, is in no way the man he pretends to be in an effort to turn a personal profit. It appears that pattern of total contradiction is continuing. In public, he spoke about wanting to get help; in private, he apparently did something very different. According to his mother, he presented the positive cocaine test to his family as a single, isolated instance in which he couldn't overcome temptation. But that isn't true, as far as anyone can tell. There are a lot of questions here, ranging from the absurd—did Jones really hide under the cage when a tester showed up at his gym unannounced, as the rumor has it?—to the merely telling. Why, for instance, did the Nevada State Athletic Commission and the UFC let Jones's fight go forward after getting word of the positive test when a lesser star would almost certainly have been pulled from the card? (Asking that one is the same as answering it.) What really matters, though, is what we now know: One day Jones felt he needed to be in drug treatment, and the very next he didn't. Whatever's been going on here, nothing is going to change.